Since the trade which sent Ronald Darby to the Philadelphia Eagles, the cornerback spot opposite Tre’Davious White has been up for grabs. In his first action for the Bills, Gaines played 25 snaps against the Eagles. Gains looked impressive, picking off a pass and earning a PFF game grade of 83.5. Gaines did well in his rookie season, earning an overall PFF grade of 78.8 in 2014, he only gave up one touchdown and 1.03 yards per cover snap which both ranked 14th that season. Wright got the start Thursday night playing 10 snaps and picking up one stop in coverage on six coverage snaps, earning a PFF game grade of 75.2. So far this preseason Wright has only allowed 0.23 yards per snap in coverage, the best of any Bills cornerback this preseason. 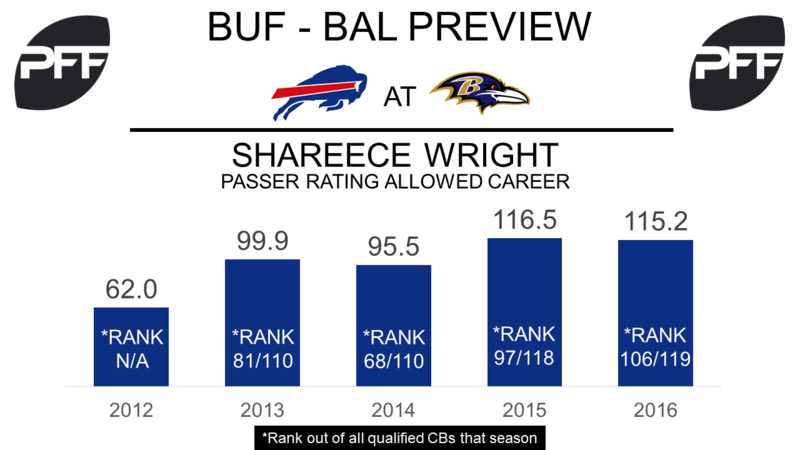 Wright has regressed in terms of passer rating allowed into his coverage since entering the league; he ranked 106th out of 119 qualified cornerbacks by allowing a passer rating of 115.2 last season. Shaq Lawson, ED – Lawson hopes to make a big impact in his second-year in the NFL, the 2016 first-round pick missed the majority of the season after having shoulder surgery in the 2016 offseason. Thursday night against the Eagles, Lawson was one of the best players on the field, earning a PFF game grade of 81.3, as the edge-rusher collected two total pressures on 12 pass-rush snaps, which earned him a pass-rush productivity (PRP) of 13.6 (PRP measures pressure created on a per snap basis with weighting towards sacks). Jordan Poyer, S – The free agent addition will be the starting free safety for the Bills this season and he will hope to improve on his 2016 performance. In 2016 Poyer ranked as the 72nd best safety with an overall PFF grade of 49.4 and he ranked as one of the worst safeties in coverage with a coverage grade of 41.1 which would have ranked 78th if he had played enough to qualify. During the Eagles game Thursday Poyer had a PFF game grade of 81.2, batting a pass and collecting one stop in coverage. 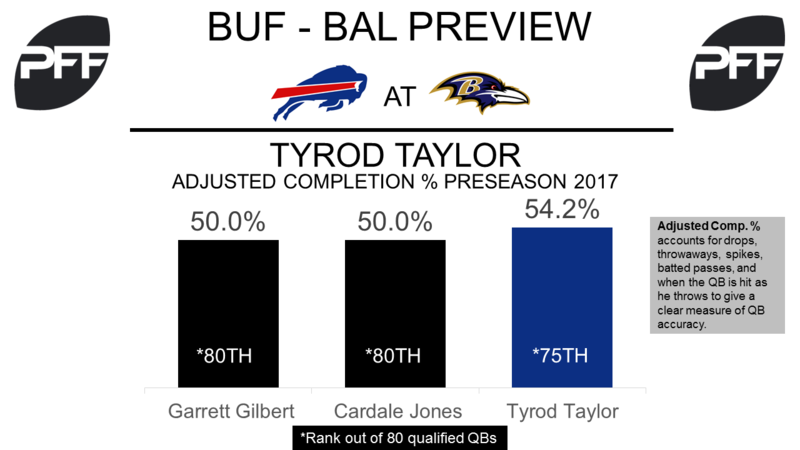 Tyrod Taylor, QB – In the two preseason games so far Taylor has struggled to impress. Against the Eagles Thursday night Taylor earned a PFF game grade of 39.3, the lowest of all three quarterbacks that played. Taylor has particularly struggled with his accuracy this preseason, his adjusted completion percentage of 54.2 ranks 75th out of 80 quarterbacks. Judon and Bowser are competing for the starting strong-side linebacker job. Through two preseason games, Judon has earned a grade of 76.3 while Bowser has earned a grade of 81.2. 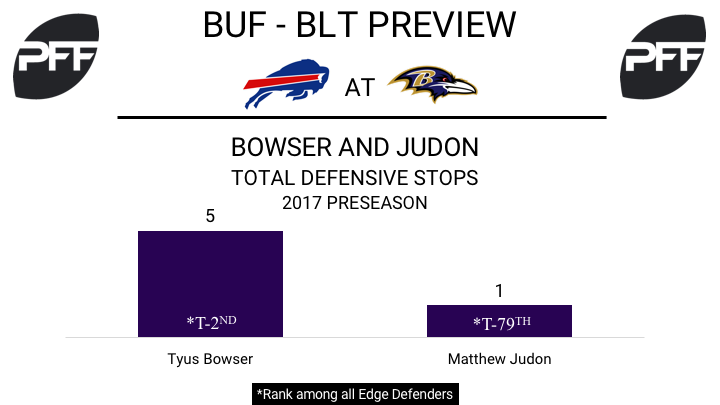 While Bowser (83.2) graded higher than Judon (67.1) in the Ravens’ first preseason game, last week Judon’s 79.2 edged out Bowser’s 74.4. In terms of pass-rushing, Bowser has been more dominant. Bowser’s pass-rush productivity (measures pressure created on a per snap basis with weighting toward sacks) rating of 17.6 (4 total pressures on 17 pass-rush snaps) ranks fourth among all 3-4 OLBs. Judon has generated just one pressure on 22 pass-rush snaps and ranks tied for 58th (out of 64 3-4 OLBs). Za’Darius Smith, ED – Another OLB, but not competing with Judon and Bowser, Smith is coming off a productive Week 2 game where he had four total pressures on 16 pass-rush snaps, tying for the third most pressures among all 3-4 OLBs last week. Look for him to continue his solid preseason this week against a Bills offensive line that ranks sixth worst in pass blocking. Patrick Onwuasor, LB – After posting consecutive games with grades over 75.0, look for Onwuasor to make a push for a starting linebacker job over Kamalei Correa, who has posted consecutive games with grades under 50.0. Onwuasor, the Ravens’ second-highest graded linebacker to this point, will be put to the test against a Bills offense that has graded fourth best running the football. 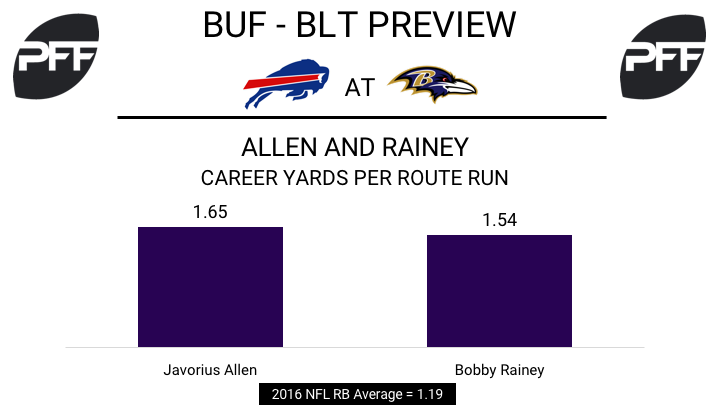 Javorius Allen and Bobby Rainey, RB – With Woodhead currently injured, the Ravens may need to keep their eyes open for a temporary pass-catching back to fill the void. Allen has a solid receiving grade of 74.9 through two preseason games and caught 45 passes in 2015. With the New York Giants in 2016, Rainey had a receiving grade of 76.3 and averaged 1.58 yards per route run, tied for ninth highest among running backs (min. 20 targets).